The CRC-11 Compact Rain Cover is fabricated from waterproof nylon material and crystal clear TPU panels on the camera's control side. It is tailored to fit the Canon XL models in standard configuration without the use of large additional external accessories and features a designated microphone and viewfinder sleeve. 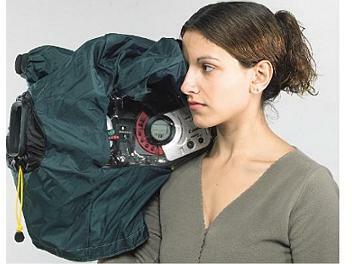 The cover slips quickly over your camera to protect it from sudden showers and is secured by a quick pull of drawstrings.